There is finally one room in my house that has all the desired art on the walls and has NO empty frames. Huzzah!! After getting the new living room rug, I started rearranging the art a bit, leaving it rather unbalanced. For the past year, this print and it’s brother have been flanking the tv waiting to be a completed composition. With the new rug, the “brother” print ended up at the end of the couch. 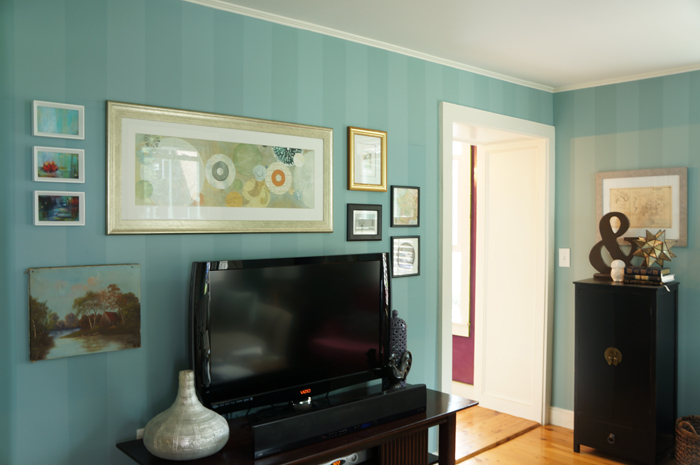 I’ve been drawn to images on pinterest that draw attention away from a tv with a gallery wall. Since we have our enormous gallery wall in the office, I decided a mini one was in order here. There was a bit of trial and error. My initial plan for the wall looked kind of awesome as composition itself, but when I looked at it with the whole room it got a little nutso busy. 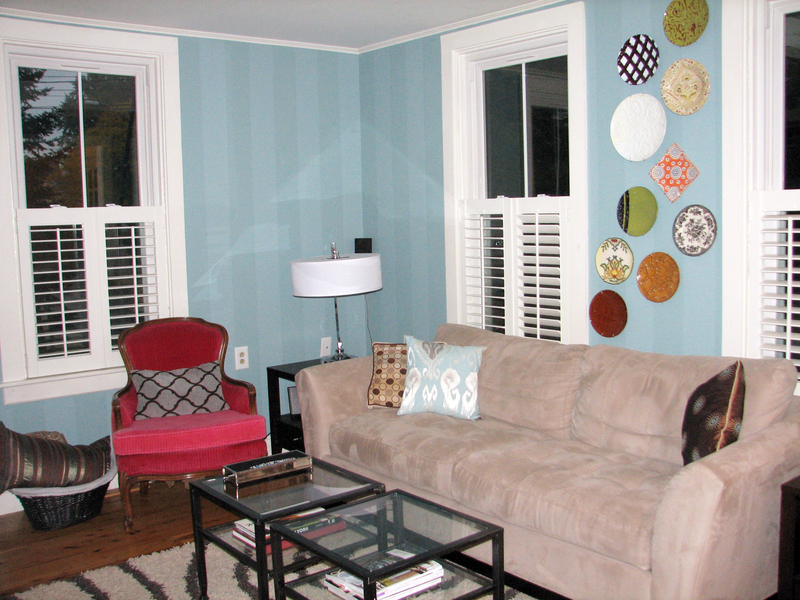 I don’t want the tv wall competing with my plate wall, afterall! I was planning to paint all the frames white or silver to unify them, but after living with it this way for 2 days, it just didn’t feel right in the room. That actually makes me sad, because looking back at these pictures, the wall itself is really successful. I really like it, a lot, but I wasn’t willing to sacrifice my other design elements to make this the feature. The whole room was starting to look crazy overdesigned. Not good. It’s not as dynamic on its own, but it makes so much more sense with the rest of the room. Did you also notice the other art switcheroo? The repro map of our town from the 1800s (that I got at a tag sale for $2) earned a place of honor after a spray paint make-over. I am also pleased to report that the dining room is painted and I’ve started cutting the picture rail pieces. I can’t wait to see this room come together like the living room has!! It looks unfinished and kind of cold in this picture. Although it did look better in person, it never really ‘clicked’. I’m a little excited for this change. I’ve been waiting for this since the day we moved in. The room didn’t miraculously get bigger, but a new rug definitely makes it feel that way! Even Hubby agrees, shockingly. Just to highlight how awesomely awesome this new rug is, check out what the living room looked like right after we moved. The old rug was shag. It was bad. Just bad. Don’t get me wrong, it looked fantastic in our previous apartment, but the living room was much larger, so a heavy rug grounded the space. In this tiny conservatively sized space, it just weighed it down. We got this rug before the cats were even a consideration, too. Shag + cat hair = impossible to clean. Even our Dyson is powerless. I’m also over the pattern. The living room was just screaming for something more sophisticated. Something like this, perhaps? 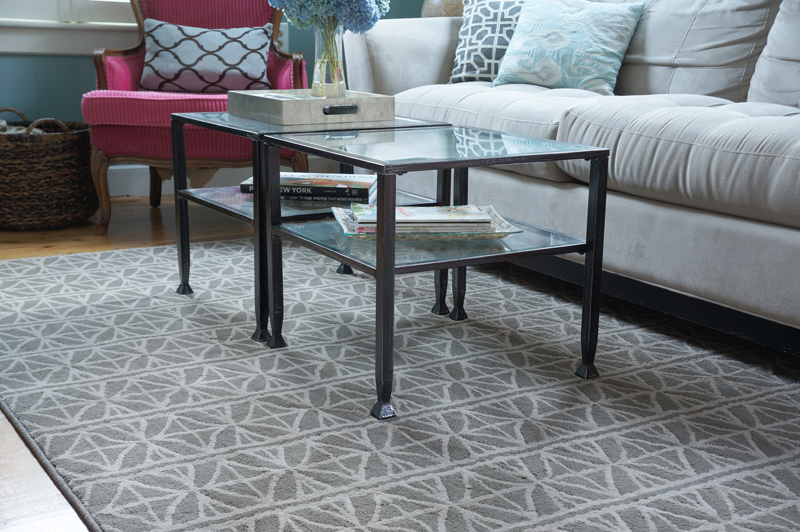 I got the new rug from Joss and Main for $155 including tax and shipping. Not too shabby for a 5×7 if I do say so myself. I still have more plans for this room, but WOW, what a difference a new rug makes! I’m really pleased with the pattern. It’s not so large (like the previous) that it will get dated or boring- it’s just the right scale to make a statement and not compete with my planned bold patterned or colored chair. Massachusetts tax free holiday is this coming weekend- chair shopping may need to happen. I’ve already warned Hubby. I’ll leave you with one last gratuitous living room shot. Random un-rug related thought: I am SOO happy with my big girl camera! I know I still have a lot of technique to learn, but the difference in quality is already obvious. I guess I’m not as bad of a photographer as I thought! I bet you couldn’t tell, but these pics were taken at dusk- you know, that time when its still light out, but completely dark inside. The manual setting on my camera is a miracle worker. 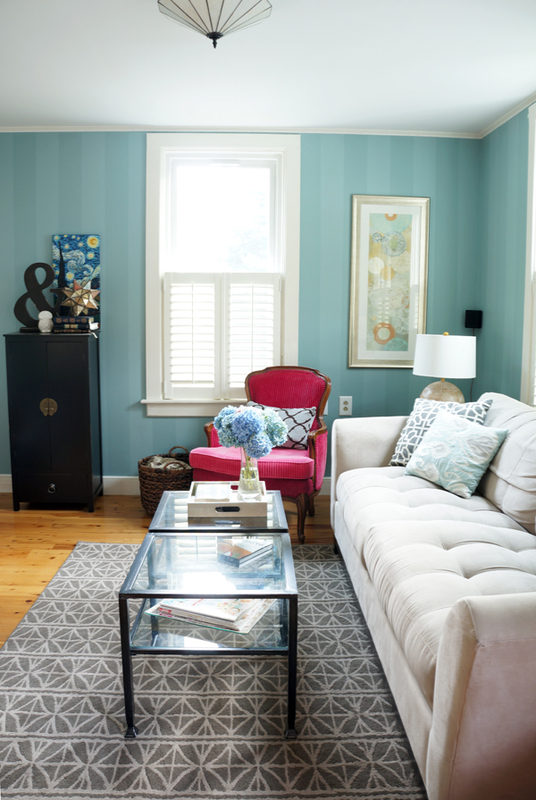 Yesterday, I was over guest posting on the blog Love Creative about how to get started when designing a room. Pop over and check it out! I’ve come to the realization that I need a new living room chair. Not want, need. It’s a very serious problem. Of course, by ‘serious problem’ I mean it bugs me to no end and Hubby things I’m nuts. You know, the usual. The current state of the living room is just OK, and I’m getting sick of just OK. The biggest issue that I see, or rather smallest issue, is the under-scaled chair. When I decided we needed to break up the living room set, we shopped the house and used a chair we already had. This chair look perfect in our office. It’s not there now. I want it back there and I want a slightly larger chair in a stellar pattern or color to take its place in the living room. 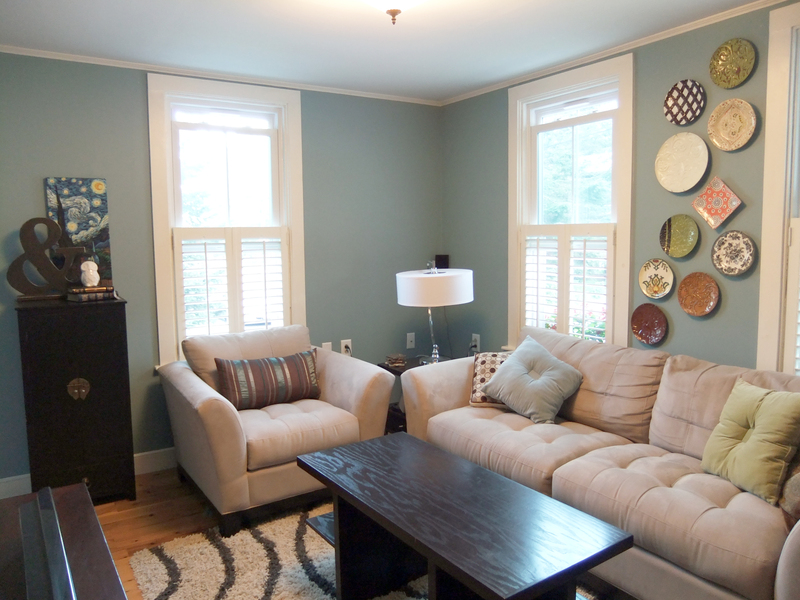 Let me start by saying- my living room still needs lots of love and accessorizing…. BUT I think it’s on its way. I would love to be able to wait and just show the finished product years months from now, but lets face it, I’m too impatient. 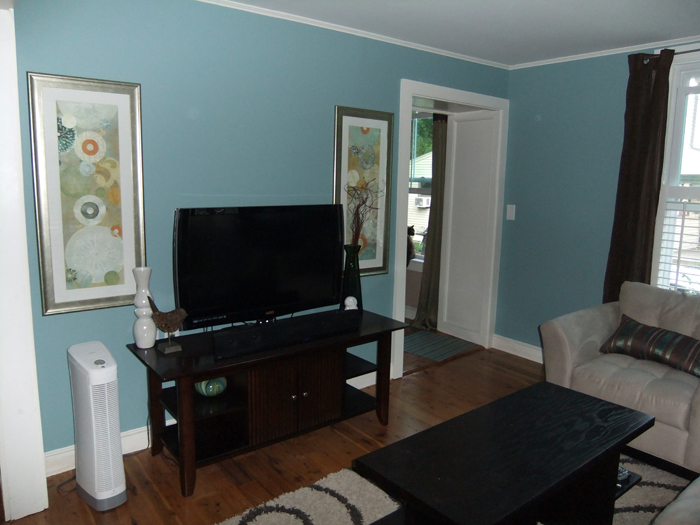 Over the past week, our living room has undergone a few major transformations. 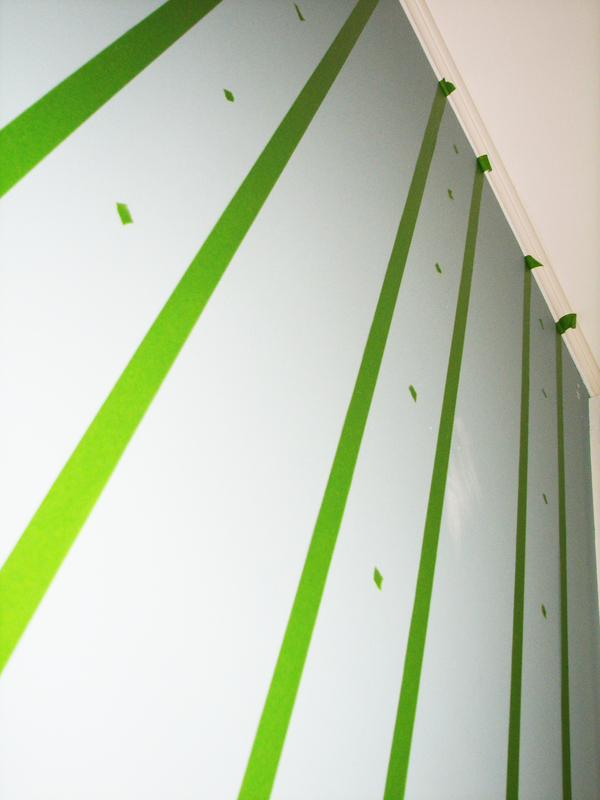 It took me a full weekend and week of evenings to get the stripes measured and taped off, then only 1 weekend to paint. Phew! I was first thinking 1 foot stripes would work. That was until I taped out 2 partial stripes- WAY too wide. So then I debated- 9″ (on the right) or 6″ (on the left). In the photo, 9″ looks a bit better, but in person, the 6″ won hands down. So the tedium began. My tools for this process were a level, tape measure and pencil. 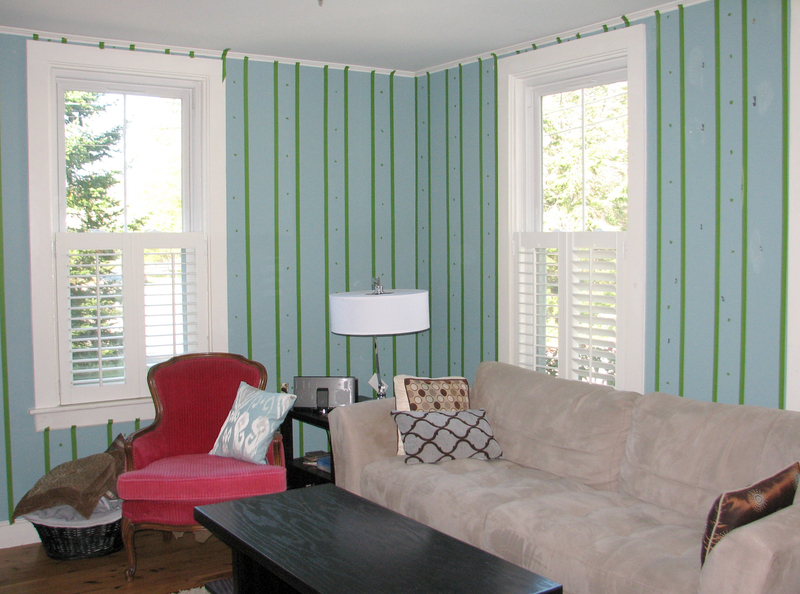 I started at the ceiling moulding at the corner and started marking out 6″ segments. 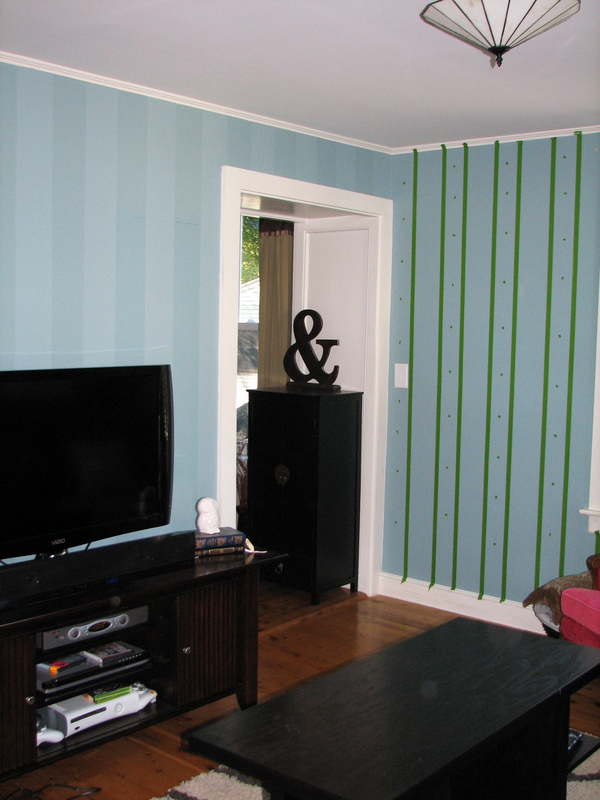 After I did a few lines with multiple pieces of tape per line, I realized it got wavy, so I resolved to have 1 continuous piece of tape down the wall- which actually ended up being easier anyway. Once I had the 6″ segments measured at the top, I took my trusty purple level (I wish they made more tools in fun colors) and measured down the wall, leaving pencil marks down the path. Once I had a few of those lines pencilled out, they got taped. 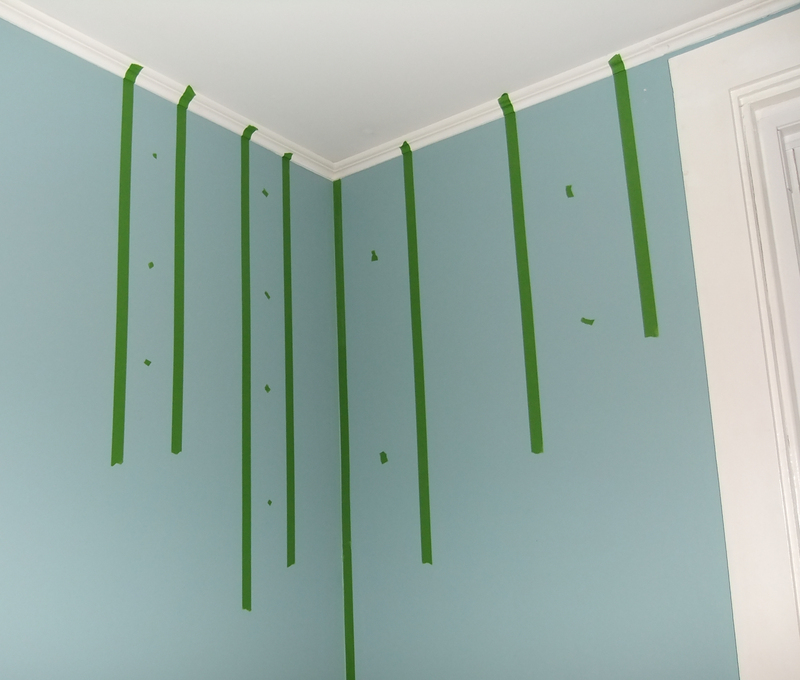 In case you didn’t guess, the ‘dots’ of tape are to illustrate where NOT to paint. There were a few spots that I had to thumb my nose at my level and just make the line LOOK right instead of be level. Afterall, this house is over 110 years old, and level is not a word I would use to describe anything in my house. So at long last, I had stripes. But they were only temporary tape. I’ve always been a blue painters tape kinda gal, but I decided to be a rebel and try Frog tape this time. I was quite happy with it in the end- as long as I made sure the tape was fully secured at the edges (by running my finger along it right before I painted) I ended up with very few spots that I need to touch up. In this pic, you can also see Transformation #2: the chair. This awesome chair has been hanging out in our office upstairs and I asked hubby and his brother to muscle the large club chair upstairs and bring this one down to see how it worked. 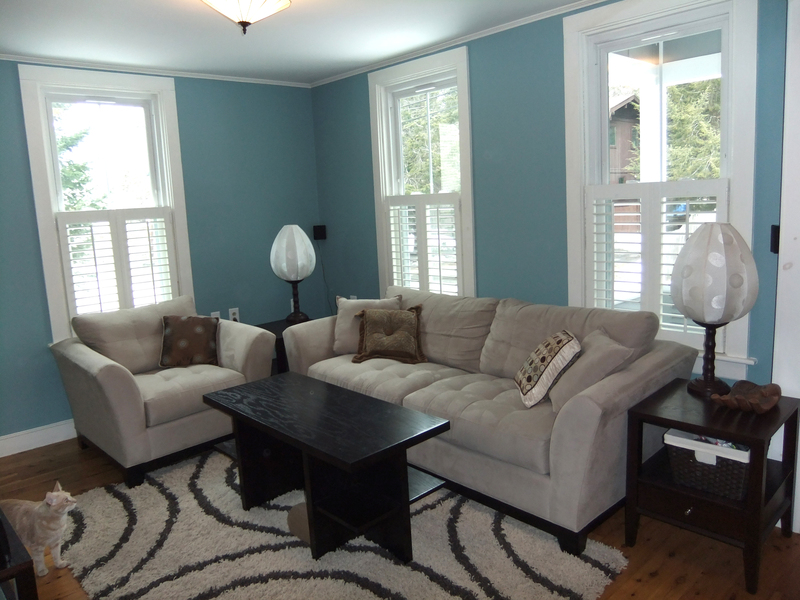 The living room looked about 5 times larger with this minor change, it was kind of remarkable. After a few days of contemplating it, I know this chair is too small for the space, but worlds better than the oversized one it replaced. I need to find a cool chair that’s mid scale and then I can send this beauty back up to the office where it belongs. The club chair pretty much takes up the ENTIRE office, so that needs to go anyway (can I interest you in buying a chair?). Anywho, back to the stripes. I used paints that I already had to mix the perfect concoction. I mixed a semi-gloss clear glaze, the blue wall paint, and a semi-gloss white paint until I got the right balance. I had painted a piece of foam core board with the wall color, then tested my color mixes on it and held the board in different lights until I mixed a color that was exactly what I was looking for: visible in all lights, but was still subtle. This picture is the perfect segue into Transformation #3: coffee table(s). Say buhbye to the wood hunk of a coffee table dragging the room down, and welcome its much more svelte counterpart(s). I found these guys on overstock and ended up paying $97 a piece including shipping. Are you ready to see it all together?? Let me first remind you what the living room looked like not too long ago. This is what my living room looks like today. Change out the ceiling light (not sure what yet, so it’s waiting for the perfect thing). Accessories!!! I want to find some awesome boxes to hide stuff and cool pottery for color pops. I’m also picturing a super oversized square boho-chic basket to hold blankets and pillows. Artwork- something needs to be on the wall. Hubby just picked up a painting in France, so I need to find a place for that. Chair- as I mentioned already, I need a mid scale chair. I need to go Goldilocks on this- I found one that’s too big, and one that’s too small- I need one that’s juuuuuuust right. Rug…. maybe something Persian- inspired to make Hubby happy? For some strange reason, the shag just ain’t cuttin’ it with 2 kitties. We got this rug before they were part of our family. Hmm, is that it? I’m sure other things in the room will evolve too as I work things out. I’m just pleased that the room no longer feels like its closing in on you, and it no longer looks like it’s straight out of a discount furniture showroom. Huzzah! Guess what I’m going to get started on this weekend! Yup, my living room is going vertical! With stripes that is. It probably will end up much more subtle than my 5 minute Photoshop example here, though. 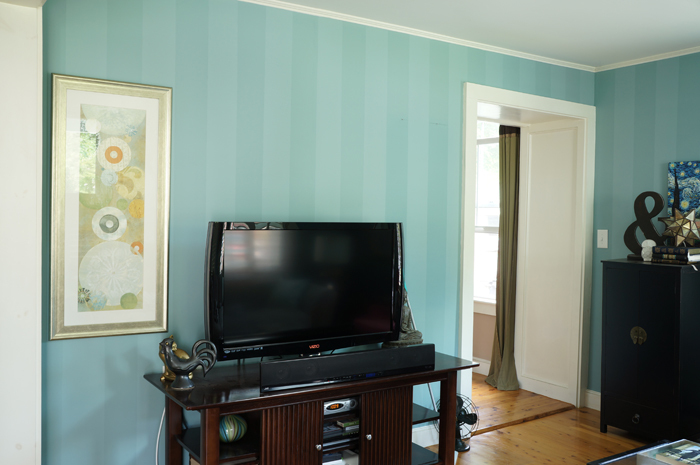 At first, I was planning to do just a satin tone-on-tone stripe which we had in our music room at the apartment. Although we LOVED it in the apartment, people only took note if I pointed it out because it was so subtle. Call me vein, but if I’m going to put that much effort in, I want it to be noticed! …..So I was toying with the idea to mix in some lighter paint with the glaze to make the treatment pop a bit more. For weeks I’ve been waffling about which to do and finally decided to let Photoshop help me decide. Once I put in the stripes (although I’m fully aware they aren’t perfect here- this took me 5 minutes people!) I was 100% convinced. brighten and lighten the room up a bit. With the large scale furniture (that we are currently living with), the space feels heavy. I’ve already got all the supplies I need to get started, I just have to bite the bullet and do it! I know it’s totally going to be worth it in the end. I’m not obsessing about what to do in the living room. No, I would NEVER do that. It’s just not how I work. Are you buying that? Any of it? I know, I know, this is becoming a common topic for posts. Obsessions’ll do that to ya. Here’s where the obsession room currently stands (sans the solid pillows which I sold at my parent’s tag sale last weekend). Hubby and I had an awesome discussion on the scenic drive home from a friend’s wedding in upstate New York on Saturday about the state of this room. We both agree that we need to focus on one space at a time so that we don’t get overwhelmed (too late). Logically, the living room is the place to start. It’s the first room you see when you come in the house and its the room we spend the most waking hours in. We also agree that it’s the room that just isn’t working for one reason or another. Unfortunately, another thing that we agree on is the fact that we shouldn’t be spending a lot of money on new furniture right now, so my dreams of a new couch will need to be put on hold. A girl can still dream though, right? Hello Love. Would you like to come home with me? Isn’t she sweet? She’s from Mitchell Gold + Bob Williams (which is located 5 minutes from the house. Coincidence? I think not). But she’ll have to wait. Hubby and I plan to “shop” our house first to see if we can spice it up with minimal $$. We plan to try our vintage red chair (which has been hanging out in the office/computer room and I don’t seem to have any real pictures of) in place of the matchy chair and see how the scale works. With a smaller chair in that spot, it might open up that corner a little bit- which is currently a dead area. I’m torn about this corner. To bookcase or not no bookcase? I keep waffling. 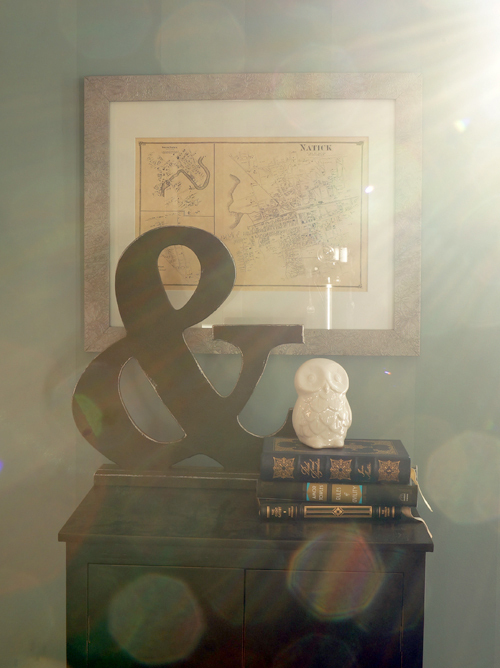 As of this current moment, I’m leaning toward no… but then I need to find a different end table for that space. Here are some living rooms that I’ve found on pinterest that have been getting my wheels turning. This is the most similar to our layout. Its a little cutesey country for my taste, but I like the mix of scales and textures. I think this couch is dreamy, but wouldn't work for us. The concept of the coffee table(s) could be a possibility, however. This weekend may be an action weekend to make something happen in this room. I’ll keep you posted!! 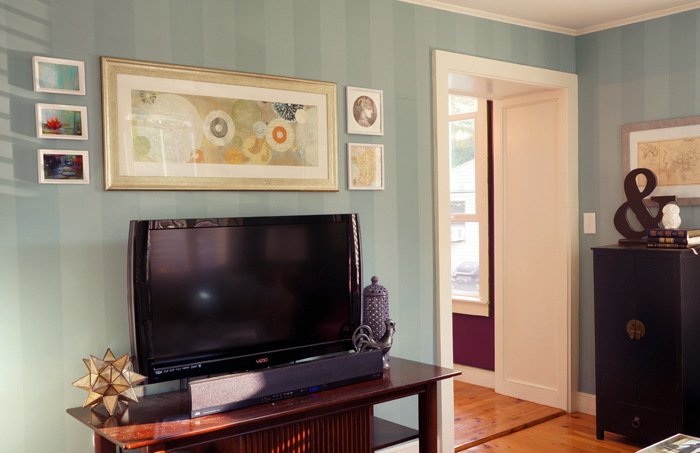 What rooms have you been obsessing dreaming about revamping? You aren’t allowed to complain about something if you’re not doing anything to change it. For example: you can’t complain about the size of your rear if you don’t get up off of it and work out. (the exception is things you can’t change of course, but if you can’t change something, you can change how you look at it and stop complaining anyway). Hubby pointed out to me that Friday’s post was a laundry list of complaints about the living room so I figured I should practice what I preach and put my $$ where my mouth is and whatever other cheesy cliche’s apply. I’ve been far too ADD with design ideas lately, so I just need to focus on one room at a time. I’m putting jewelry organization/display and some other projects on hold and focus on the room that irks me the most: the living room. 2 notable changes were made over the weekend. #1. Harry Potter’s room has a new door! 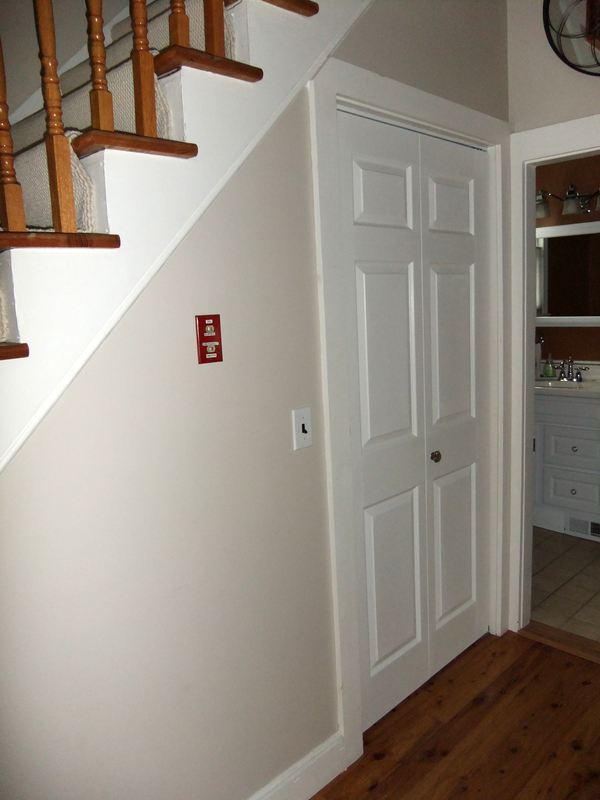 No, Harry Potter does NOT live with me, however we do have an awkward closet that spans the entire space under the stairs. 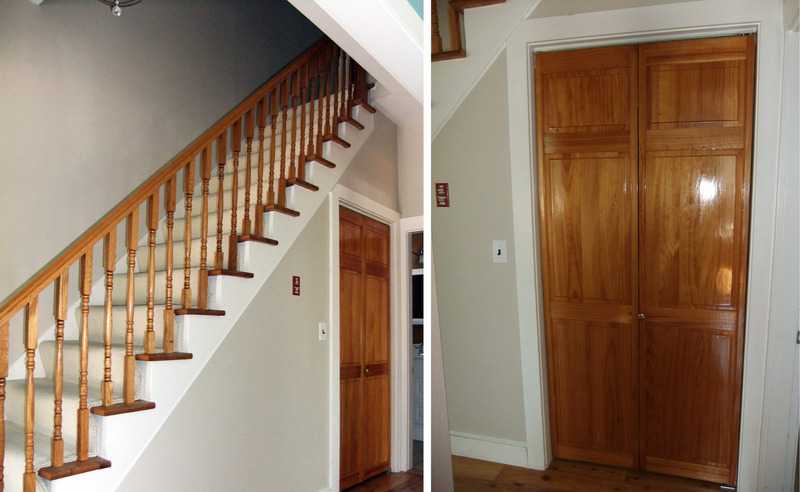 We call this Harry Potter’s room, or the hall closet, whichever you prefer. The bi-fold door to this space was the only non-white door in the entire house and was a very awkward orangey wood tone that was not finished well in the first place. Since the hall is wide open to the living room, I consider them 1 large space. Pre-primed white doors with paneling similar to the other doors in the house were less than $50 at my friendly local Home Depot, so I was on the ground running. I’ll spare you the enthralling progress shot of painting white primed doors white satin and I’ll jump to the after. As a finishing touch, I picked up a mercury-glass knob from Anthropologie and put up a mirror from HomeGoods to give the space more presence. You like? So much better if I do say so myself! 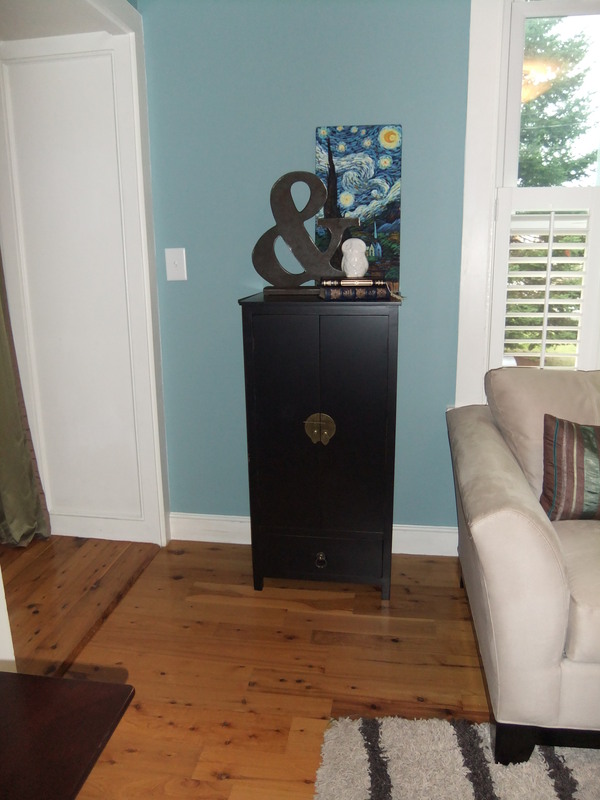 Weekend Project #2: New vignette/storage. 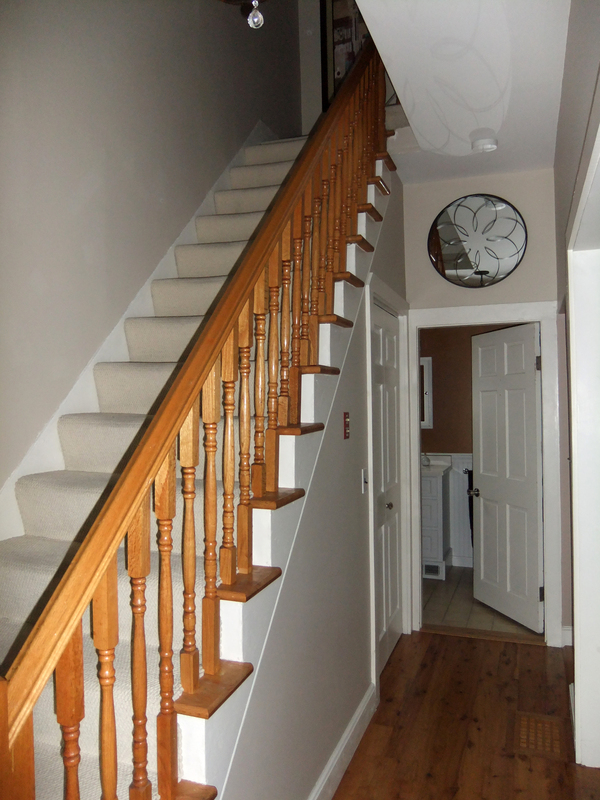 I’ve been hunting for some type of table to put against the stair wall, but am challenged by the narrow space. While looking at HomeGoods, I fell in love with a small asian style cabinet that was too deep. After re-measuring the area several times (hoping that somehow the space would multiply- no luck), I decided to bring it home anyway. It worked as I was hoping next to the chair (which Hubby is all about replacing now, yay!). 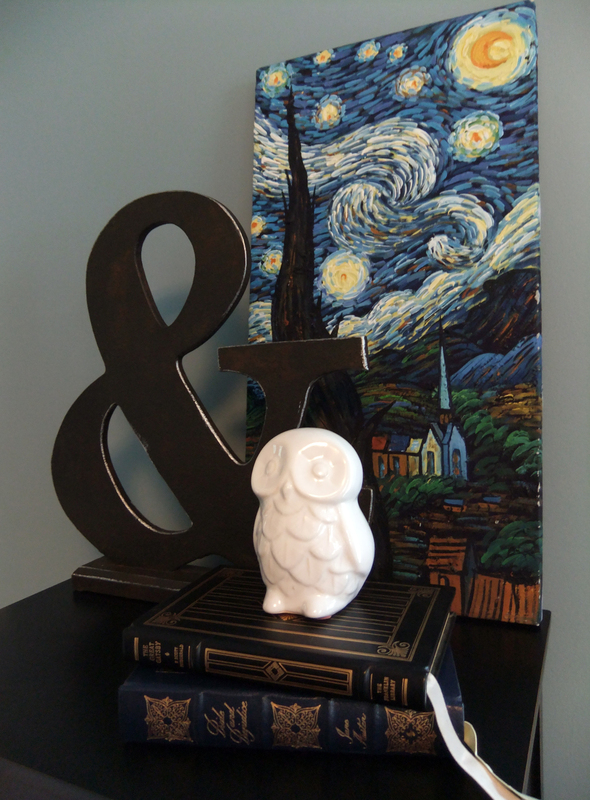 I took down the brown curtains (not the hardware yet though) and styled the new cabinet with a new “&” sign, Starry Night (removed from the opposite wall), a few tag-sale books, and Archimedes the owl. I’m so pleased to see the living room finally start evolving!